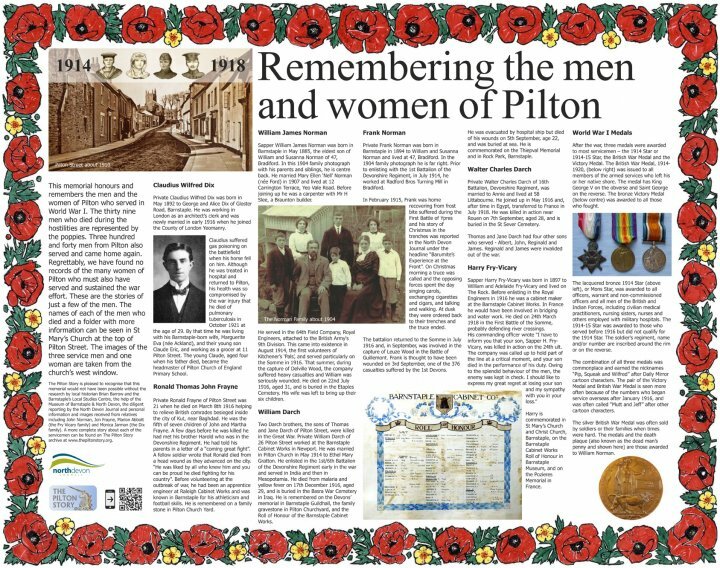 The Pilton Story has created a new memorial in Rotary Gardens which honours and remembers the men and the women of Pilton who served in World War I. It was unveiled by Barnstaple Mayor Ian Roome on 8th September 2018. The thirty nine Pilton men who died during the hostilities are represented by the poppies around the edge, created by Pilton artist Al Brown. Three hundred and forty men from Pilton also served and came home again and are remembered on a board in the South Porch of St Mary’s Church. A further nineteen men who had connections to Pilton, or who died later as a result of their involvement in the conflict, have also been identified. Regrettably, we have found no records of the many women of Pilton who must also have served and sustained the war effort. All fifty eight men will be remembered on a separate plaque to be fixed to the front of the plinth on which this memorial sits. The plaque tells the stories of seven of the men who died. However, lack of space means that the memorial gives only part of those stories. More complete versions can be found elsewhere on The Pilton Story archive. Just search for their names. The names of each of the men who died and a folder with more information can be seen in St Mary’s Church at the top of Pilton Street. The images of the three service men and one woman on the memorial are taken from the church’s west window which is, itself, a memorial to them. The Pilton Story recognises that this memorial would not have been possible without the excellent research carried out by local historian Brian Barrow and his helpers, the work of Barnstaple's Local Studies Centre, the help of the Museum of Barnstaple & North Devon, the diligent reporting by the North Devon Journal and personal information and images received from relatives including John Norman, Jon Frayne, Marion Abbott (the Fry Vicary family) and Monica Jarman (the Dix family).